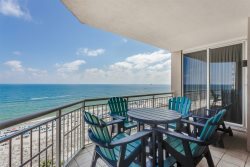 Vacation in this beautiful, luxury condominium in an exquisite beachfront setting. Indigo covers seven tropically landscaped acres on snowy white beaches, gorgeous blue waters of the Gulf of Mexico and has every possible amenity. The lushly landscaped zero entry free-form pool, the complexes most popular feature, meanders lazily between the condominium and the beach. Amenities also include a children's pool, hot tub, gazebo, tennis courts, fitness center, locker rooms with steam and sauna, grilling areas. This gated community offers two and three bedroom residences with private elevator entry. Located on the east end of Perdido Key, Indigo is convenient to restaurants, shopping, groceries, and attractions.